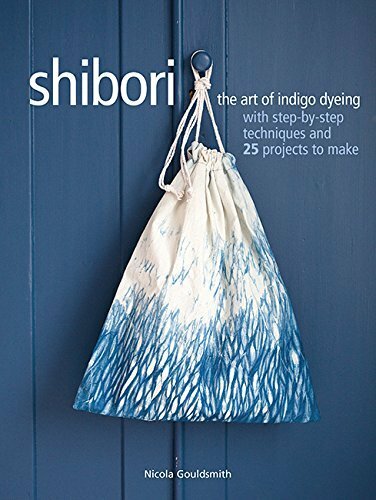 Learn the Japanese art of shibori, including tie-dyeing, folded, rolled, and sewn techniques, using indigo dye. Then make one of the 25 projects using the fabric you have created. Shibori is the name for a range of dyeing techniques that have been practiced in Japan for centuries. Using just plain white cloth and indigo dye, you can create a huge range of patterns that will each be unique. Full photographic step-by-step instructions are given for preparing the vat and plain dyeing, so you can master these steps before you move on to the different types of shibori. Each chapter then starts with a photographic step-by-step explanation of a different shibori technique. The first chapter covers kanoko and kumo (tie-dyeing with and without stones). Next there is shibori itajime (folding the fabric and clamping it between pieces of wood), then arashi (wrapping fabric around tubes), and nui (sewing and gathering the fabric with thread). After each technique has been explained, there are simple projects to make that show off the patterns you have created at their best. A sewing techniques section completes the book, with all the basic stitches and skills you will need to make the projects.